To do so, go to Contacts > Team Members (or External Contacts, depending on where the user was added). Click on the 3-dot control at the end of the user row, and click Archive. Archived Users are moved to the Archived tab on the Contacts page. You can un-archive them at any time by clicking the 3-dot control at the end of the user row and choosing “unarchive”. What happens when you archive a user? 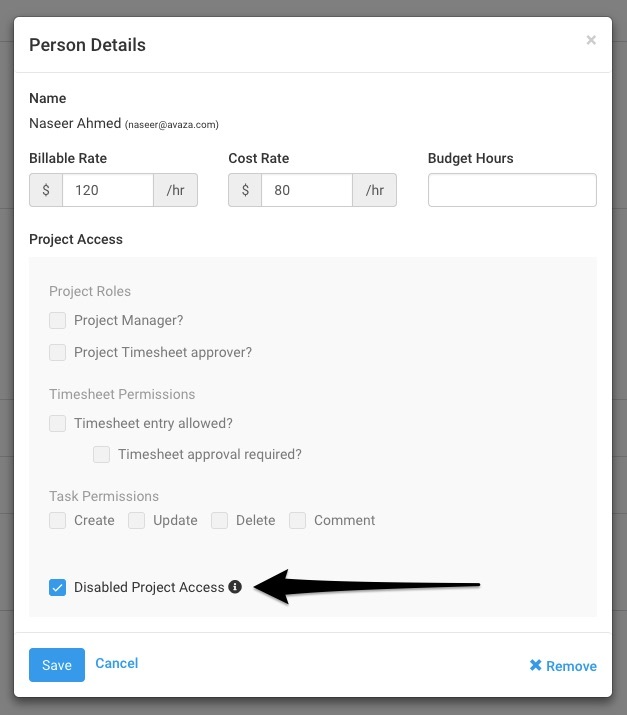 Disable all recurring tasks, invoices and expenses assigned to or created by the user. What happens when you un-archive a user? Open the Projects > Project Settings page for the projects this user needs to be a member of > click on the name > uncheck “disable project access”. Now you can start assigning tasks to this user again. Note: Archiving users does not affect your billing. We bill based on the plan and add-on users (or integrations) added to your subscription. Please go to Settings > Avaza Subscription > Manage Plan Add-ons to remove any extra licenses you may have freed up as a result of this action. Need more help? Contact our support team via chat or email them at support@avaza.com.